St Bartholomew's Church is a Grade 1 listed building that enjoys a unique position in the medieval town of Lostwithiel (Charter 1189) and in the affections of many people, a considerable proportion of whom are not part of the church's regular congregation. The Friends of St Bartholomew's Church Lostwithiel (FOSB) is a registered charity that provides an agency through which those who have been married, christened or attended concerts in the church, and local residents or visitors who value the building, its history and its traditions, can help maintain the fabric of this lovely building for the benefit of present and future generations. 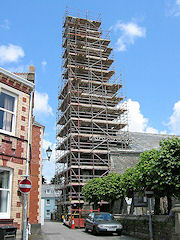 FOSB's mission is to raise money for the maintenance of St Bartholomew's Church, Lostwithiel. FOSB organises a range of events throughout the year appealing to different interest groups in the catchment area of town as well as remoter supporters and visitors. The purpose of these events is not only to raise money, but to increase public awareness of FOSB's mission and to recruit new Friends. In addition, FOSB raises money directly by soliciting one-off as well as regular donations by standing order, Gift Aided when possible. Legacies are always welcome. FOSB was set up in 1995. Thanks to their supporters the Friends have been able to make grants to St Bartholomew's PCC amounting to £104,215 towards upgrading the church electrics (£5,000), renovating the vestry (£3,215), restoring the church roof (£40,000) and installing a new central heating system (£16,000) and, in 2008, towards the renovation of the Tower and Spire (£32,000) and re-hanging the Bells (£8,000). 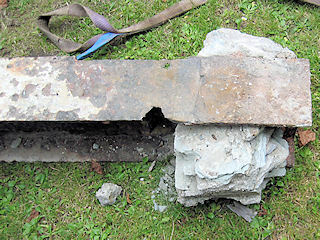 FOSB's work is ongoing. 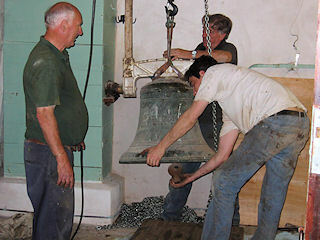 For example the Parochial Church Council (PCC) has sought grants for refurbishing the bells and to make them safe by replacing the supporting steelwork at a total cost of around £42,000. 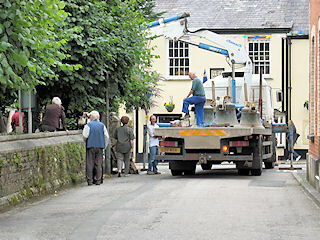 In July 2009 work began on removing the clock, the bells and all their supporting ironwork. However these spectacular one-off projects inevitably divert funds from routine maintenance, and FOSB aims to increase its income to match outgoings in the longer term so as to make planned maintenance the norm rather than the exception. 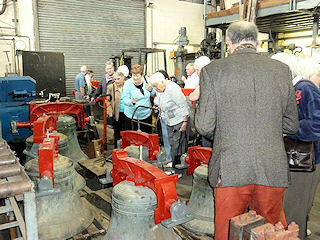 At 2pm on 28 September 2009 fifty-six of us travelled by coach to Nicholson Engineering Ltd to see the work in progress on the bells and supporting ironwork. 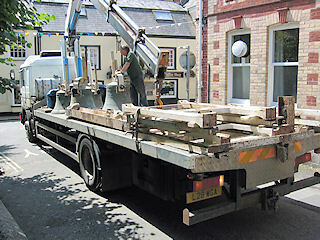 Here are the six bells from St Bart's, now fitted with refurbished headstocks and new bearings. 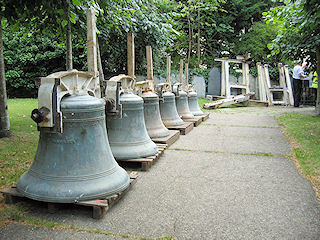 The bells are expected to be returned towards the end of November. Andrew Nicholson holds his audience spellbound. The grey steelwork is the lower tier with four bells of the six bells - an upper layer of steelwork has yet to be added to support the remaining two. 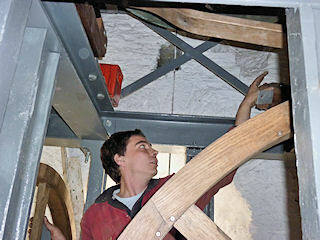 With the bells due to ring this evening some images of the bells rehung in the tower were needed. 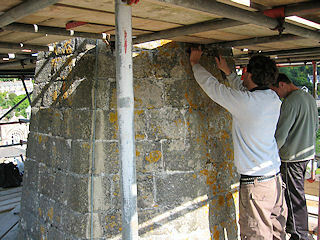 With Bob's assistance the photographer clambered up among the bells and took these shots of the bell hanger, Mark (of Nicholson's), at work. 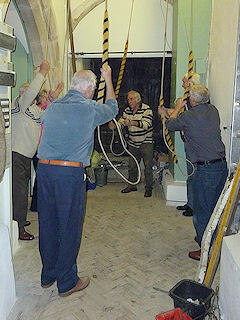 And here, a few hours later, are the bell ringers ringing the bells once again. 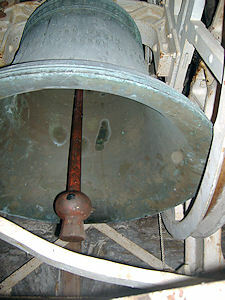 The smiles on their faces showed that they were pleased with the way the bells were performing. 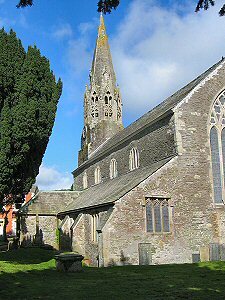 The Friends of St Bartholomew's Church, Lostwithiel (FOSB) are delighted to have been able to make grants totalling £40,000 towards the restoration of the tower, spire and bells, and intend energetically to continue fundraising for such projects for the foreseeable future. Join us by becoming a Friend. 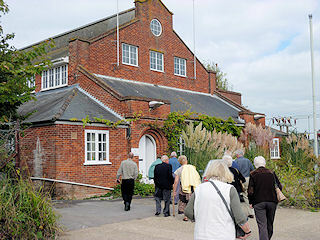 Membership is open to all who are interested in furthering the work of The Friends and who have made a donation in the current year to FOSB of not less than £5. Members over the age of 18 years have the right to vote. 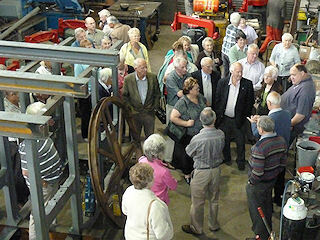 And then we are always on the lookout for volunteers to be officers, executive committee members and helpers. The rest of the site fleshes out this sketchy introduction. The three pages Building, Appeal and How to Help set out FOSB's stall, while the Resources page gives access to much downloadable documentation. We hope you enjoy the site and we look forward to hearing from you, so please contact FOSB to have a chat and find out more.